Oamaru was a port town, once NZ’s 9th largest town, with a bustling trade in grain and timber. Lamb and mutton were first frozen and sent to the UK from here. 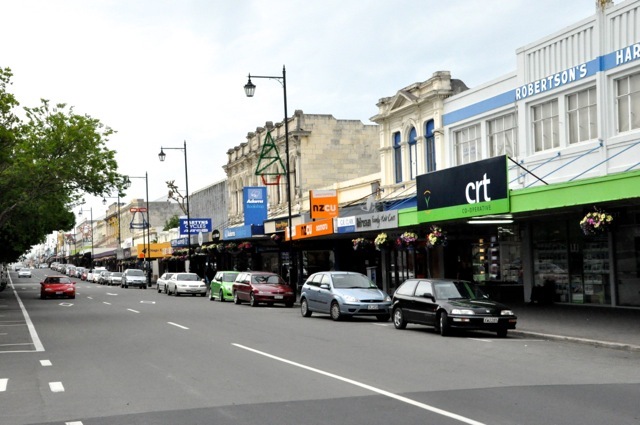 It was a commercial center for NZ’s gold rush days, and an immigration destination. The town was also blessed with a nearby supply of cream-colored limestone (whitestone) that was easily worked; given the prosperity of the times in the mid-t0-late 1800’s, and the presence of able and imaginative architects and stonemasons, Oamaru became “The Whitestone City”, both in its commercial business buildings and its grain and wool warehouses. Today it’s a sleepy little town (population <13,000) with one of the finest 19th century streetscapes one can imagine. 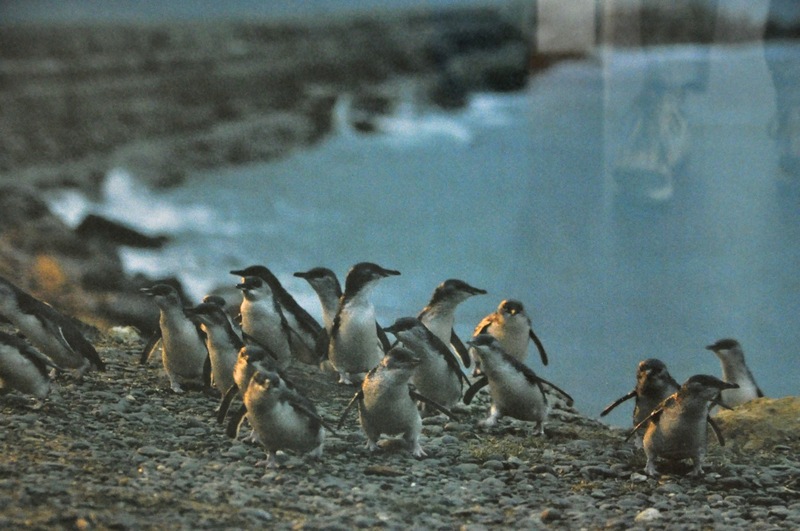 It is also the home of both blue penguin and yellow-eyed penguin colonies, the main reason we have come here. The road signs suggest they’ll be easy to see. Oh, let’s start with the penguins! They’re breeding now, with nests on land. The parents leave the nest early to go fishing and come ashore at the end of the day to feed the chicks. The yellow-eyed penguins come ashore in the late afternoon/evening, the blue penguins at nightfall. The problem is, the penguins are (purportedly) skittish and will not come ashore if they see humans; and not coming ashore is a negative from the chick’s point of view. 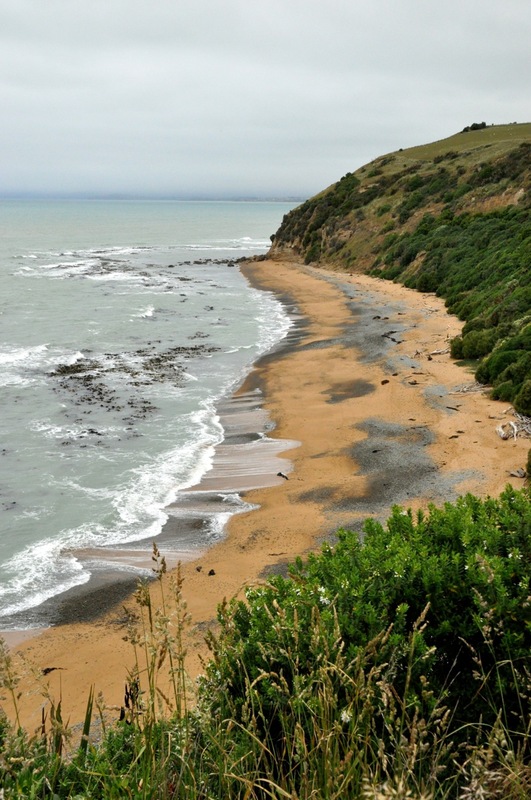 Accordingly, the viewing platforms for the yellow-eyed penguins are pretty high up on a headlands, as you can see from the picture of the beach there on the left. A little disappointing not to get any closer, but we’ll see. There could be hundreds coming ashore. After waiting for awhile, staring at an empty beach and jockeying for position in the small crowd, someone sees a single penguin come ashore. Penguin? Where? Perhaps you can see from the 2nd beach picture below that this auspicious landing is a little underwhelming; if you look closely, the penguin is that little dot near the center of the picture. We are not close, although we have brought along a pair of binoculars (that we share with others in the crowd). Still, more penguins will be coming; but then to our horror we all see a lone human male who has ignored all the posted signs and is walking on the beach. Our penguin immediately turns and runs back to the sea and is gone. The male walks to the edge of the greenery and sits down to wait. Oh great. The small crowd discusses lynching, but that means going down to the beach. After we wait awhile longer with nothing happening, we decide to give up and go for dinner. 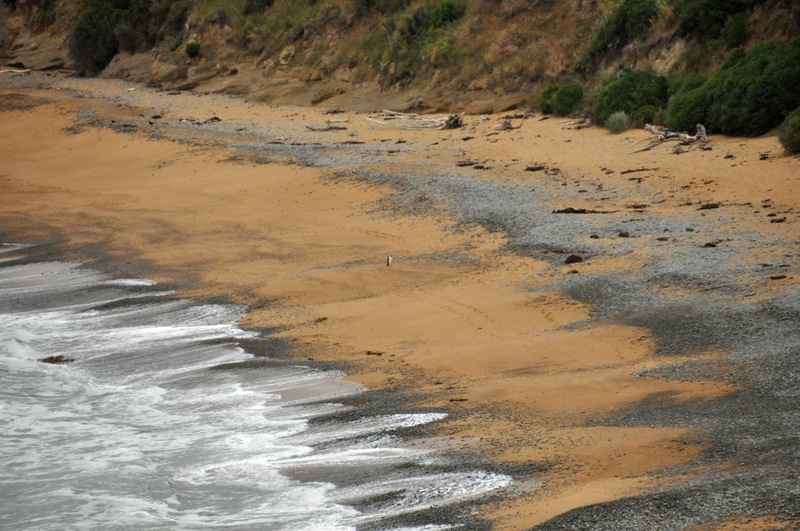 As we walk out, we spy another penguin coming ashore, and the path has taken us to a point just opposite his position. We’re actually pretty close! 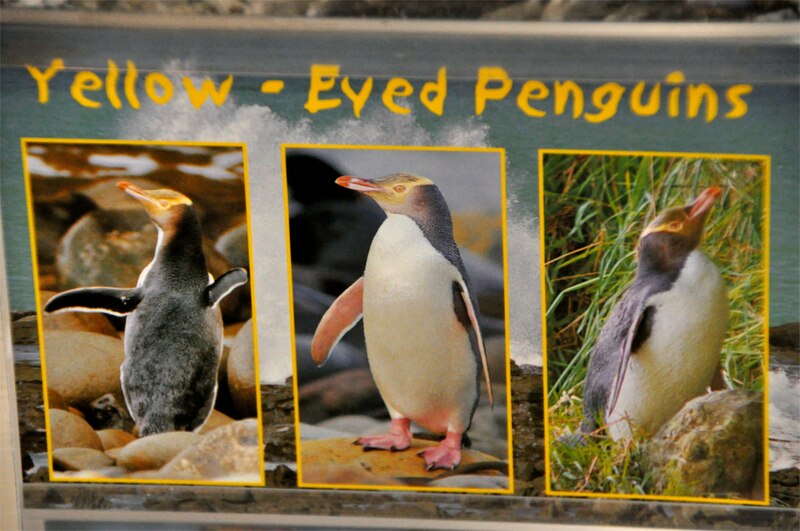 The picture to the left shows what a yellow penguin is supposed to look like, and although we’re too far away to see the yellow eye band, we can easily see that this is indeed a yellow penguin. He’s really cute, with very pink feet. He’s in no hurry, and we get to see him leisurely strolling in and grooming himself; apparently penguins get air trapped in their feathers that needs to be squeegied out. Check off seeing the yellow-eyed penguin, but seeing the blue penguins is another matter; they’re the smallest of the penguins, and they come ashore when its dark or nearly dark. They can be found all along the coast of NZ, including the North Island, but a whole lot of them (two colonies!) are here. One colony nests somewhere near the Oamaru wharf and is off limits, but apparently penguins will nest anywhere they want, thank you, which means they will nest just about everywhere. 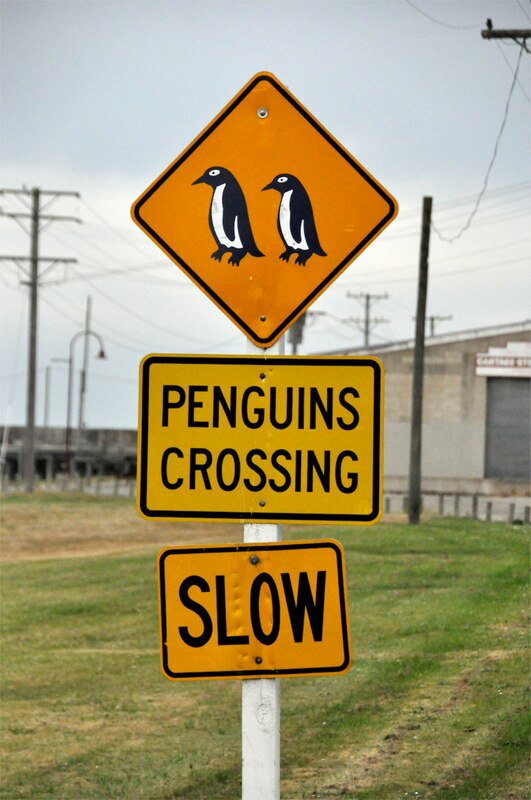 So if you sit patiently along the Oamaru shoreline around dusk you can maybe see a few waddle past. Well, “patient” and “maybe” is why I don’t like fishing. Alternatively, for $40 one can sit in the grandstand of the Penguins Crossing visitor center that’s equipped with red lighting (blue penguins don’t see that spectrum) and watch a hundred or so come ashore and walk a few feet in front of you. Now you’re talking! The only downside is – no cameras allowed! Too many idiots with cameras with flashes have ruined it for all. I am crushed, but this should still be great. And it is. We take a daytime tour; there are a lot of penguin nests (50? 60?) actually at and around the visitors center, many in a central courtyard, but they’re off limits and one must keep to the elevated boardwalks that lead to the grandstand. There is an exception, a room devoted to seeing 4 nests equipped with cameras (and red light). One can actually lift a flap and look directly into the nests (3 have chicks in them). And OH MY! Penguin smell in the nests is pure ammonia and very old fish! After just a minute my eyes are watering from the ammonia. These are tough chicks, let me tell you! They’re also small and fluffy. A guide at the visitor center tells me there is a penguin under the boardwalk and I hightail it there and lay down to see, and sure enough there is a penguin just a few feet away, getting some fresh air. He’s cute! I can take a picture! He seems to be more a gray color than blue, but apparently he has a head-to-tail iridescent indigo-blue streak down his back that I can’t see. Evening comes and we get to the grandstand early to get front-row seats. The penguins have quite a steep climb up from the water, over jumbled and large uneven rocks, with the waves crashing into them. It looks pretty ouchy, but the guide says the penguins actually like to play with the surf. Glad I don’t have to make that trip every day! As it gets dark, the first “raft” comes ashore, about 20-30 penguins. The penguins hunt alone, but when they approach shore they wait around until a bunch of others show up, and they come ashore as a group. You can see them (dark shapes on the water) coming in, and then with a wave breaking, “pop” 4 or 5 of them are out and working their way up the rocks. They are really cute! They make it up the big rock incline and stop in the rocks just before a flat grassy area that goes past our grandstand and into the central courtyard. There the raft congregates (those that aren’t going to their nests elsewhere), preening and milling and waiting. I took a picture of a picture that comes pretty close to showing what this looks like (our rocks are lots bigger! ), shown to the left. The milling continues and tension seems to be building, and suddenly one brave penguin can’t stand it and darts for the safety of the courtyard, the others in close pursuit and looking for all the world like the Keystone Kops, and off they go right in front of us, the group waddling like mad, some occasionally falling on their bellies in their hurry. There are actually just 2 holes in a fence that they have to navigate through, so the group bunches up and slowly funnels through. Once inside it’s party time, and there is a whole lot of squeeking and crying and snorting and males fighting over a female and the nests welcoming them home. Then all is quiet while we wait for the next raft. Nearly 200 penguins come ashore over the next 90 minutes, and it’s fun to watch each time. As we leave the center, there are a bunch of people and cars near a streetlight by the side of the road. And here are three more penguins, with nests on the other side of said road, not sure what to do with the crowd around, but certainly not running away either. The light is so dim it’s hard to focus the camera, but I watch for the Great Escape to occur – by golly, I’ll get pictures yet! Everybody is about 20 feet back. After gathering their courage the 3 Penguiteers nonchalantly saunter across the road until half-way across, and then for some reason there is the mad dash for safety! Cute! Penguins aren’t the only birds around. There was a pretty impressive shag convention nearby as well, as shown. Oamaru looks like any other small NZ town, as this picture shows, until you get near the center and see these fabulous whitestone intricately decorated buildings. They’re all pretty much from the same era, built over a 20 year period starting around 1865, and they occupy several streets coming up from the wharf to the main business area. Below are just some of the side streets – it feels like you’re on a movie set! Below are pictures of some of the business-area buildings, along with a couple of close-ups of details. The warehouse area is a bit grittier but the buildings are still amazing. The jewelry is paua shell, from abalone. Pretty stuff. The Oamaru Gardens is also very nice (and large), giving a sense of the wealth that this city once enjoyed. We were impressed with their unusual trees and extensive flower gardens, including what must be every color of columbine one can imagine. We had never heard of Steampunk before, and having seen it, we’re still not sure what it is. Safe to say sculpture – and far-out psychedelic-like art. How about fantasy mechanical, or wierd retro functional surreal stuff. For instance, the futuristic/retro steam locomotive sculpture there in the front has wheels that turn while it emits smoke and flame. I’ll end the Steampunk presentation with the outside courtyard art. So what can you say about Steampunk? Maybe strange but interesting … or better, very very strange but interesting. Next post – a trip over Arthur’s Pass. Hi JR, thanks for the encouragement! Always good to get. Hope you’re mending well. We’ll be back June-ish, see you then!